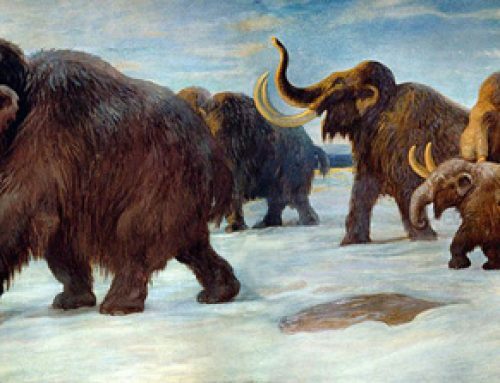 The second of our articles on new prehistoric animal models from Schleich in 2016, focuses on the larger models made by the company, the range that has been termed “World of History”. We will also provide details of retirements from this range. Briefly, let’s deal with the changes to the “World of History” tagline. From our Schleich notes it seems that the umbrella brand of “World of History” is being dropped. This tagline used to include prehistoric animal models as well as Schleich’s “World of Knights” range. Dinosaurs*, otherwise termed Dinosaurier will become the umbrella brand for all prehistoric animal models made by Schleich, the larger models, the “small” model range introduced in 2015, the minis and the various play sets, puzzles and so forth. We accept that for model collectors and for dinosaur fans, the tagline “Dinosaurs” is going to be misleading. Schleich will not be limiting themselves to the Dinosauria, they will be introducing a number of non-dinosaurs under this branding next year. We assume that these changes have been made to make it easier for non-specialist retailers, perhaps those retailers who just regard all prehistoric animals as “dinosaurs” and are happy to dedicate shelf space in their stores to a “dinosaur brand”. 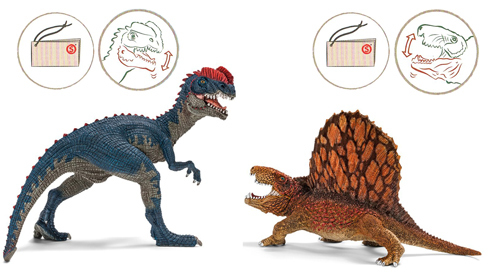 Schleich intends to add a number of new models to its range of larger model the first two, which should be available around late January 2016 or thereabouts are a Dilophosaurus and a Dimetrodon. Both models have articulated lower jaws and come with an information booklet. These models will be available to purchase individually. Everything Dinosaur team members have not had sight of the information booklet. We cannot comment as to the accuracy or otherwise of the information that these tag booklets that accompany the models will contain. However, in Schleich literature we have seen these two models listed under the promotional strapline “The first giants of the dinosaur world!” Model collectors and dinosaur fans will no doubt be aware that Dimetrodon was extinct long before the first dinosaurs and that this reptile was a Pelycosaur. In addition, many enthusiasts might query the reasoning behind Dilophosaurus being regarded as one of the first giants of the dinosaur world. Marketed under the strapline “First giants”. We are aware that Schleich have plans to launch other models, for example, a picture of a Dunkleosteus (placoderm) have been widely circulated. This model is not likely to be launched until after June 2016. There are other models that have been proposed and have been planned but at this stage information remains embargoed. As new models come in, so older models are retired. Although the information below has yet to be officially confirmed and we at Everything Dinosaur are unaware of any formal announcements from Schleich, the following models are not included in the January to June Schleich catalogue. In the past, when items have been omitted from brochures, it has proved to be a portent for the retirement of that model. The Stegosaurus in the picture above will still be available as part of a box set entitled: “At home with the herbivores”.